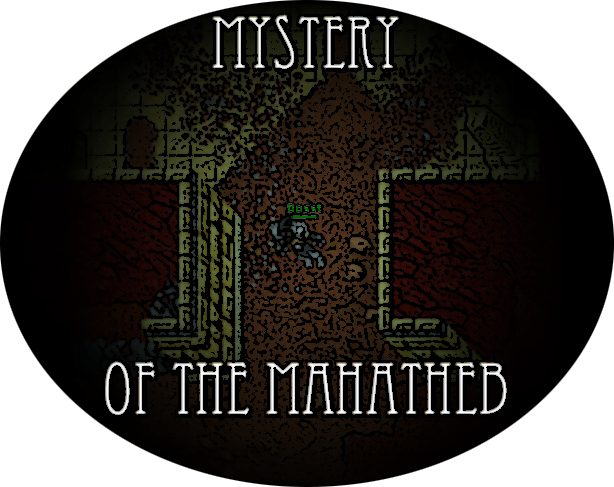 Mahatheb – the vizier of Ankrahmun, right hand of the pharaoh Ashmunrah and undoubtedly the most mysterious boss in Tibia. He has been introduced to the game as long with a new location – Forgotten Tomb in the summer update 2015. Entrance to the tomb is located north-east of Edron. 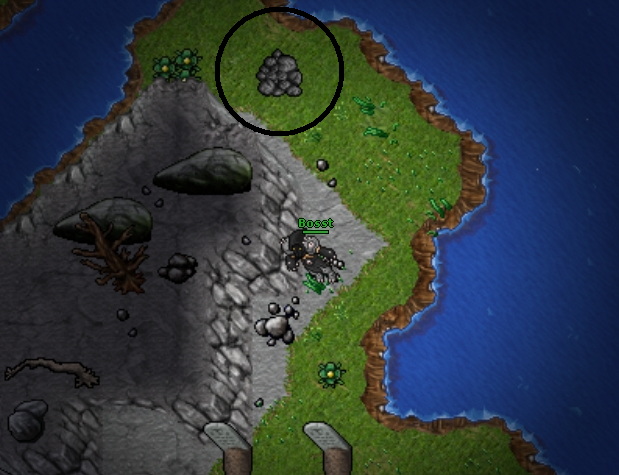 Check the map and the screenshot below for the exact location. Ancient, Egyptian style tomb in Edron? Yes, it might seem strange, but the answer is on the lowest floor of the tomb, in one of the sarcophagi. There is a book written by Mahatheb’s chronicler, it tells the story of the vizier’s life and explains why his tomb is so far away from the desert. These are the contents of the book. It's quite long, but worth reading. Mahatheb was the greatest vizier the city of Ankrahmun had ever seen. His counsel was prized and his wisdom legendary. He served the pharaoh Ashmunrah dutifully and faithfully. The wise Mahatheb had ever been wary of the studies of the pharaoh’s dark son, Arkhotep. But Arkhothep whispered lies into the ears of the pharaoh and poisoned his mind and heart. In his wisdom, Mahatheb saw the futility of his attempts to destroy the mists of treachery that clouded the pharaoh’s vision. Instead, he planned to help his liege in another way. Knowing that Arkhothep was using dark sorcery to gain power, he decided to gather more might himself in order to fight him. Being no sorcerer, the vizier looked to the powers of the legendary djinn, and studied ways to bind them to his will. After long research, he learned that even the djinn had to bow to someone who knew their true name. He pondered his options, when seemingly fate smiled upon him and provided him with an opportunity too good to pass it by. The well-known king of thieves, Qual'Jehari, had fallen in love with Xetharis, the beautiful daughter of the vizier. When he asked for her hand in marriage, Mahatheb presented him with a condition: to steal the true names of the djinn and give them to him. Qual'Jehari, love-stricken and blinded by arrogance, accepted without hesitation. He left the court at once, promising to return soon. Years passed, and the thief was not seen or heard again, while the vile Arkhotep grew in power and assembled his co-conspirators. Running out of time and options, the vizier tried other ways to stop the pharaoh’s son, but to no avail. When Mahatheb was desperate and almost ready for a deed of desperation, a ragged pauper appeared in his chambers. The vizier was about to call the guards when the pauper revealed himself to be no other than Qual'Jehari. He was gaunt and marked by his quest, having lost both his eyes and his youth. With shaking hands he presented Mahatheb some scrolls of paper that had the names of numerous djinn written upon them. But the vizier’s joy was cut short when he recognised that in truth only a tiny fraction of all the djinn names had been acquired. In his anger he had the thief flogged and thrown out on the streets. He studied the names of the djinn he had acquired and wondered how to put them to best use. But luck is a treacherous lover, and it had already betrayed the good Mahatheb. The thief had withheld one of the djinn names, and used that djinn to steal the beloved daughter of Mahatheb. This caused so much attention that the evil Arkhothep became aware of the vizier’s actions and put his own plans into motion. Mahatheb however was wise enough to see the threat coming, and used the powers of the djinn to flee Ankrahmun, to a foreign land, taking all of his servants and riches with him. But he had underestimated the great heights of power that Arkhothep had already climbed to. The vile prince used his sorcerous might to cast a death curse on him, and all the might of Mahatheb’s bound djinn was not powerful enough to protect him. All he could do was to prolong the inevitable. He used his remaining might not to build himself a palace as he had intended, but a tomb in which he planned to endure the passing of time until the one day he would rise again. His djinn erected the tomb, and Mahatheb was embalmed by his servants, who were then put to death by the djinn so they could join their master in the afterlife. Only I, his chronicler, was allowed to live a little longer to tell his tale. When this book is finished, I too will drink the poisoned wine that the guarding djinn will serve me to fulfil my destiny. May we all one days rise again by the power of the wise Mahatheb. Now, as you are a little bit familiar with the background story of the Mahatheb, let’s talk about the boss himself. He has been killed about 70 times since his introduction to the game, yet it’s not possible to find any screenshot with him neither on any fansite, nor on the Internet. Basically speaking, no one knows how he looks like, what are his abilities and of course what does he drop. It’s hard to predict his respawn time. I carefully analysed the statistics and found out that he even appeared day after day on Eldera once! It might be the hint that his respawn can be somehow triggered by player’s action. It is very unusual for the boss to appear so often. On the other hand, I checked the tomb hundreds of times. I even left my 75 ms there to check daily. Of course I didn’t meet him, but I've noticed something strange. Look at this screenshot of the last room on the last floor of the tomb. 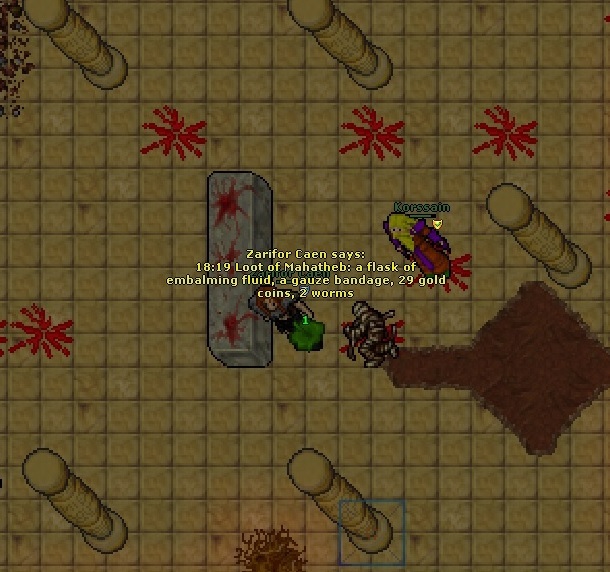 As you can see there is a single vampire and it’s the only vampire respawn in the whole tomb. 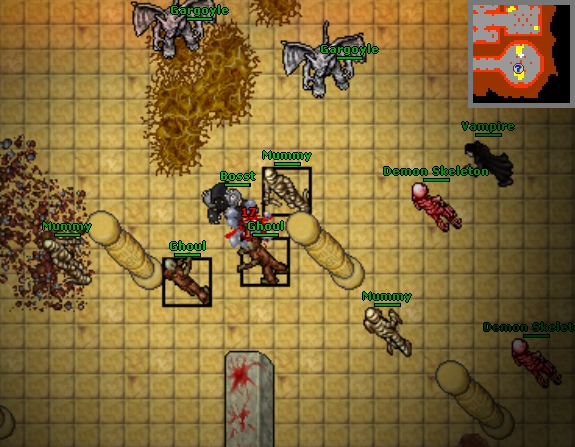 But sometimes, a strange thing occurs – instead of the vampire there is a bonebeast spawned. I’ve seen the bonebeast there only 5 times. It must mean something, maybe it’s “the key” to make the boss appear. Who knows? Killing every single monster in the tomb 3 times in a row. Walking on every sqm in the tomb. Luring the vampire/bonebeast/djinn around the chamber. Putting various items in Mahatheb’s sarcophagus. Standing in the chamber for a few hours. So fellow bosshunters, have you ever seen the Mahatheb? Please follow the posts in this thread. 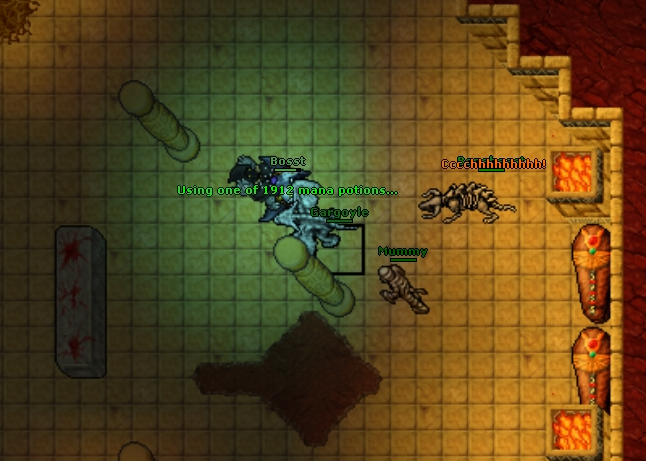 Our user Monte (who also made a great research) and me managed to spawn the boss. The mystery is getting revealed. Stay with us. It's bound to the overall amount of killed creatures within the tomb. 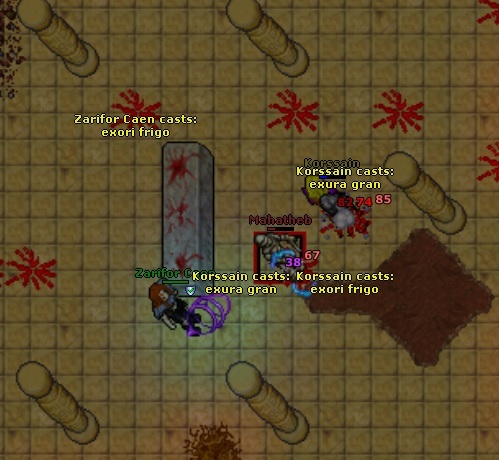 It is (was) heavily botted on Eldera, even though the actual tomb is worse than the ones in Ankrahmun, so I guess the guy doing so tried to loot some rare item. Mahatheb looks exactly like Ashmunrah and the other blue pharaohs, it has the exact same looktype. I thought so. Killing specific amount of monsters within the tomb is the only thing I haven't tried yet. 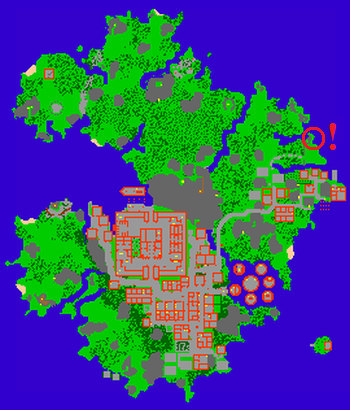 Anyway, you are probably the first player ever to share concrete info about this boss, so thanks a lot and respect. Do you happen to know, how exactly does the spawn work? I mean, do the boss respawn the next day or immediately after the amount of killed creatures reaches some point? Good point with the Mean Masher, however there are at least some screenshots showing it and there aren't any with Mahatheb. Interesting. I am intrigued now, I would LOVE to see a picture of Mahatheb. But I will definitely go to the tomb and check it out by myself. Very interesting, thank you for sharing this info. I will now look for this boss in my daily bosscheck, and follow this thread. I guess i will have no luck finding him, but it is worth a try. yesterday i killed a lot of monsters in this cave and nothing of this boss appears. Does anyone have any tips? Probably more monsters need to be killed, I think it is similar to killing Yielotaxes in order to summon Raging Mage, but we do not know how much monsters we need to kill.